The writer stands way out over others in his ability not only to create a wildly imaginative story but also posesses the incredible writing skills necessary to make the story come alive. So superbly written that the characters and the action in "Haunted" appeared to take place right before my very eyes. I've made it a goal to read every novel he has written, and am already way into "Rant" which is again making me want to hail this one-of-a-kind writer. I encourage all who read this book to recommend it to others. Chuck Palahniuk should be a household name. 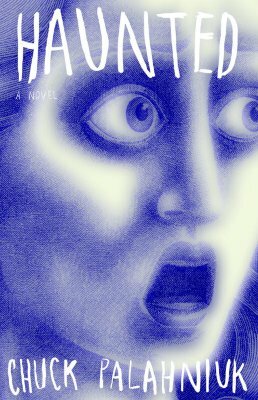 Palahniuk's "Haunted" is a wonderfully twisted collection of short tales about the real and imagined ghosts haunting the lives of a group of colorful characters on the writer's retreat from hell. The themes of man's inhumanity to man (or more precisely man's inhumanity to him/herself) and need for conflict and suffering are interestingly illustrated. However, in the end it is the short tales that will burrow into your brain with unforgettable mental images that will keep readers coming back for more. A word of warning, Palahniuk's prose is not for the weak of stomach or faint of heart.